If this molecule is turned off, cancer cells stop growing and die. Normal cells, however, are not affected by blocking HDAC11. The researchers are now looking for compounds that block selectively HDAC11. Several substances inhibiting so-called HDAC enzymes have been studied in trials searching for new anti-cancer drugs in recent years. “Trials have shown that HDAC inhibitors are very effective in arresting growth of cultured cancer cells. But apart from a very rare type of lymphoma, these drugs unfortunately do not clinically affect malignant tumors,” says Prof. Dr. Olaf Witt, who heads a research department at DKFZ and is pediatrician at the Center for Child and Adolescent Medicine of Heidelberg University Hospital. In the cell, histone deacetylases (HDAC) are responsible for removing small chemical tags called acetyl groups from histone proteins. Histones serve as coils the genetic material wraps around in the nucleus. The presence or absence of acetyl tags determines where genetic material is accessible and can get transcribed. Now this is where Witt and his colleagues suspect the reason for the problems in clinical application of HDAC inhibitors. Currently available substances equally block all members of the large family of HDAC enzymes. Thus, they interfere with vital cellular functions and also harm healthy cells. This can lead to severe side effects preventing their administration at a sufficient dosage. Searching for a solution to this dilemma, Witt’s team came across a member of the HDAC family, HDAC11, which was identified only recently. The researchers could show that many cancer cells, including cells of breast, liver and renal cancers, produce extraordinary high levels of HDAC11. This has not been observed in healthy cells, and hardly any specific functions of HDAC11 are known there. “It therefore seemed obvious that a specific HDAC11 inhibitor would specifically target tumor cells, where this enzyme appears to play a critical role,” says Dr. Hedwig Deubzer, first author of the article. As there are no specific HDAC11 inhibitors available yet, the team took a different approach to verify their hypothesis. Using molecular techniques, they turned off production of HDAC11 in breast, colon, prostate and ovarian cancer cell lines and likewise in control cells of healthy tissues. The result: Cancer cells without HDAC11 were impaired in viability and more often underwent cell death (apoptosis). By contrast, loss of HDAC11 did not cause any noticeable changes in normal cells. “The result suggests that selective blocking of HDAC11 would act exclusively on tumor cells,” says Hedwig Deubzer. Numerous highly specific inhibitors against various cancer-relevant enzymes have been developed in recent years, with some of them already approved as drugs. This encourages the Heidelberg research team­, jointly with Bayer Healthcare, to look for a suitable substance that specifically targets HDAC11. HDAC inhibitors belong to a group of drugs classified by researchers as “epigenetically effective” drugs. These agents influence the chemical tags that a cell attaches directly to the genetic material or to the packaging proteins of genetic material such as histones. These tags play a substantial role in regulating gene activity. In the past few years, evidence has been accumulating that epigenetic tagging defects promote cancer development. 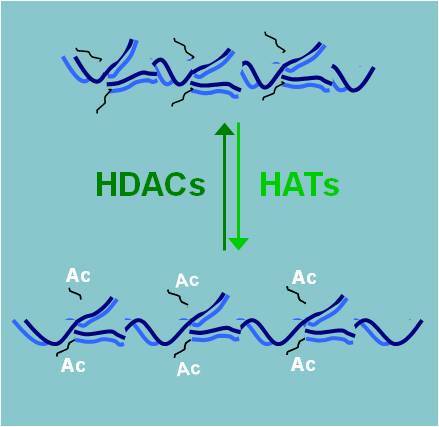 Novel agents such as HDAC inhibitors are intended to correct such defects.